Nicholas Roerich painted this picture in 1901. The inspiration for the painting was a sea voyage, which the artist undertook two years earlier to Novgorod. During the trip, the weather was surprisingly good, and the artist thought for a moment that once our ancestors swam in the same way – Rusichi. The project of the painting has long been conceived, and only in 1901 did he present it to the public. Emperor Nicholas II liked this picture so much that the emperor expressed a desire to purchase this painting. As the main material, the artist used paints for folk painting. With their help, Nicholas Roerich drew a boat, a river and a red sail, symbolizing belonging to Rusich. At that time, a new movement, modernism, began to spread, and the artist skillfully reconnected better the traditions of modernity and the aesthetics of the past. Roerich managed to achieve maximum simplicity of the image, thereby transferring the entire depth of his plan – to show his contemporaries what conditions our ancestors swam along the rivers and which vessels were used for this. The artist showed a subtle combination of all the details in the painting “Overseas Guests”, without missing even the most inconspicuous elements – cloaks for cloaks. 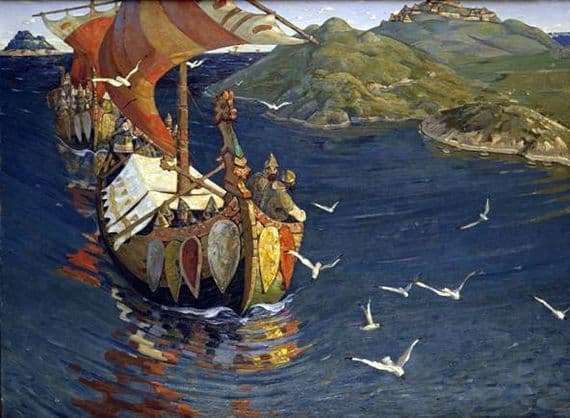 Historians have noted that the picture refers to the heyday of Kievan Rus, when not only Russians, but also Normans and Polovtsi floated along the way “from the Vikings from the Greeks”. It is noticeable in the picture that the Russians used the Drakars of the northern peoples (they can be easily distinguished from the front with a stylized mythical dragon). Thus, the plot of the picture refers to the X-XI century. It depicts two ships sailing in good weather in the direction of Novgorod. The picture is painted in a very simple style and it seems that the time in that era was as quiet and beautiful as the weather on a dark blue river.